I get more emails asking for spring break suggestions than for anything else. And the emails are remarkably similar – people wanting ideas other than Hawaii and Mexico that are warm and Zika-free and, ideally, no more than a few time zones away. Two-way jet lag for a one-week trip isn’t ideal. One of my standard suggestions has been Chile – essentially turning spring break into fall break. It’s only four time zones from California and one from New York and it’s amazingly diverse, with cities, mountains, coastline, islands and deserts. There’s something for everyone. Chile is geologically active but safe and easy to visit. The last time I visited was three years ago when my son and I traveled to Santiago and Easter Island. It was time to take my own advice and head down with the entire family for spring break. We started in Patagonia for three nights, spent two nights in Santiago and then flew north to the Atacama Desert for four nights. We took two extra days off school to make it work. Our trip to Patagonia began with a delay. United’s 3:19pm flight from LA to Houston that would have lined up perfectly with its one daily departure to Santiago was delayed an hour and a half, putting us into Houston ten minutes after the Santiago flight was supposed to depart. Luckily, United held the Santiago flight for us and our luggage, taking off 25 minutes late. The flight was uneventful and we got into Santiago roughly on time. An hour later we were through immigration and customs and checking in for our LATAM Airlines flight to Punta Arenas. The Punta Arenas flight was spectacular. Apparently, it’s not common to have a perfectly clear view of Torres del Paine. The pilot announced that the towers were coming up on the left-hand side and virtually everyone on board crowded across the aisle to see them. The pilot even tilted the plane so that those at the wing could get a view. Or maybe the plane tilted because everyone was on the port side. Either way it was a gorgeous view. For years we’ve seen Tierra Patagonia on lists of the best/coolest hotels in the world. 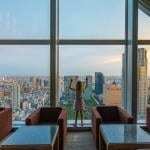 We didn’t need much more convincing – we like to stay in amazing/iconic hotels whenever possible and check out whether they’re kid-friendly. We arrived into Punta Arenas, got our luggage and hopped into a Tierra van bound for the hotel. Note: this is a four-hour drive. Our kids weren’t thrilled to hear that, especially following 20 hours of travel just to get to Punta Arenas. They may or may not have made comments like “I already hate this trip,” “this won’t be worth it,” and “I wish I had gone to Oklahoma with Lulu.” But we made it to the hotel just fine and immediately everyone was in a better mood. The hotel, built low into the landscape with graceful curves and huge windows looking out at the stunning mountains of Torres del Paine, is striking. We were shown to rooms 7 and 8 which had closeable outer doors, essentially turning the rooms into a suite. The kids had three single beds in their room and we had a king-size bed in ours. 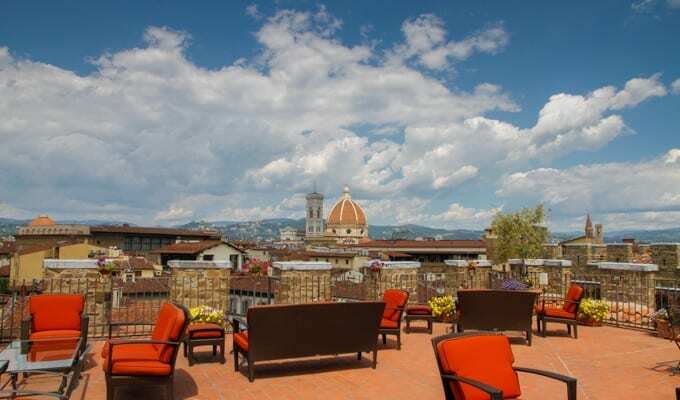 Everyone loved the rooms – and the view of sunset, perfectly timed for our arrival. After dinner at the hotel (everything is at the hotel since there’s nothing but nature nearby), we booked our excursions for the next two days. Kineret, Tierra’s excursion expert, had years of experience guiding families around the national park and recommended four half-day trips for us: two hikes; a horseback ride; and a driving/walking adventure. We had been uncertain how many days to book at the hotel and Kineret said that three nights / two days are perfect for families, since in two days you can see virtually all the kid-friendly highlights of the park. After staying there, we absolutely agree. We were paired with Filipe for our trip to Patagonia, who met us at 9am and went with us to the Laguna Azul, roughly half an hour from the hotel. We started at the lake, walked partway around the lake, and then headed up into the hills. The kids were immediately impressed with Filipe and his knowledge of, well, everything, but they really liked the walk for the animals. Torres del Paine national park is filled with guanacos and rheas. We didn’t know what guanacos and rheas were before, but they’re now the kids’ favorite animals. Guanacos are similar to alpacas and llamas, but cuter. Rheas are similar to emus, but cuter. We saw thousands of guanacos on our trip to Patagonia over two days and maybe 50 rheas. We also saw two pumas…because animals need predators. The kids loved seeing and photographing the guanacos, but they also liked finding guanaco bones everywhere and trying to reconstruct the animals, and they liked ordering and eating guanacos as well. Yes, our kids understand the circle of life! Filipe teaching the kids about plants that are able to create their own microclimates. Travel really is the best education! Laguna Azul is down the hill. The kids trying to piece together as much of a guanaco as possible. They loved hunting for bones on our trip to Patagonia. For the horseback riding, we drove 45 minutes or so around Lake Sarmiento to Estancia Lazo. We’re a family of riders – everyone but me – and in the past year we’ve gone riding in Iceland, Ireland, the US and now Chile. This was an hour and a half ride through lichen forests, with views of Torres del Paine, partially shrouded in clouds. There are also four-hour rides available, but on a cold, slightly rainy afternoon with three kids, an hour and a half was perfect. My seven-year-old appreciated that she was able to go without a lead rope for the first time outside of the US, and my wife and 11-year-old galloped some. We all enjoyed it. Our second day Filipe met us again at 9:00am and this time we drove an hour and 15 minutes into the park for a hike to the Salto Grande waterfall and then through the park to Lake Nordenskjold at the base of the towers. We all loved this walk, and it was fine for little legs. The kids thought it was particularly interesting to walk past hundreds of trees burned in the 2011 wildfires. The views were amazing the entire hike, including at the end of the trail where we took a break and had some chocolate that Filipe brought with him. Probably my favorite of the four excursions we did. Theoretically, this is a great hike to do on a trip to Patagonia, walking through prime puma hunting ground up to a cave with ancient paintings. Other guests loved the hike, with several people telling us that they got up close to pumas (highly dangerous to guanacos but not to people). We may have loved the hike if it wasn’t raining the entire time. And if we didn’t leave our rain pants in the room, after not needing them for our previous three excursions. And if we saw pumas. And if our kids’ legs weren’t still a little tired from the long morning hike. My nine-year-old son actually says that this was his favorite excursion since much of the walk wasn’t on worn trails and he liked the cave, but the rest of us were soaking/tired at the end. This trip to Patagonia was as much about Tierra Patagonia as the excursions around Torres del Paine. We all loved the hotel, and the kids spent a lot of our down time not, well, down – they headed out to explore. The clouds were ever-shifting, at times completely obscuring the mountains across the lake, but in three days we had two gorgeous sunrises and one perfect sunset. We didn’t have much rain at all, other than on our Hunter’s Trail hike. Per my comments above, three nights were perfect for seeing the highlights of the park with kids. Without kids, I would have loved to do the 8-hour hike to the base of the towers. We easily could have stayed longer, relaxed, explored around the hotel and tried the spa, but the hotel is expensive enough (below) and spring break is short enough that it made sense to move on. 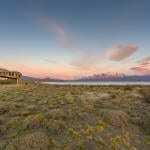 Sunrise overlooking Tierra Patagonia. The gold strip is the hotel! I loved the feel of the hotel. This is the hallway to our rooms. Very few bugs. My daughter is normally a magnet for mosquitos and other biting insects. It was nice to be somewhere where that wasn’t a concern. The hotel staff was amazing. I appreciated that the servers only filled our kids’ water glasses halfway – always one of the kid-friendly things that I notice. Rainbows – we saw eight, mainly from the car driving to/from excursions and to the airport. Filipe, our guide who knew absolutely everything. The kids learned a lot! The time in the car. The hotel is four hours from the Punta Arenas airport, and excursions required a couple of hours in the car each day. Of course it’s a necessary evil and worth it, but the kids weren’t happy with all the driving. No stuffed guanacos or rheas in the gift store! Actually, it would be a nice touch for the hotel to give kids small stuffed guanacos at check-in, especially given how far most of them have traveled to be there. 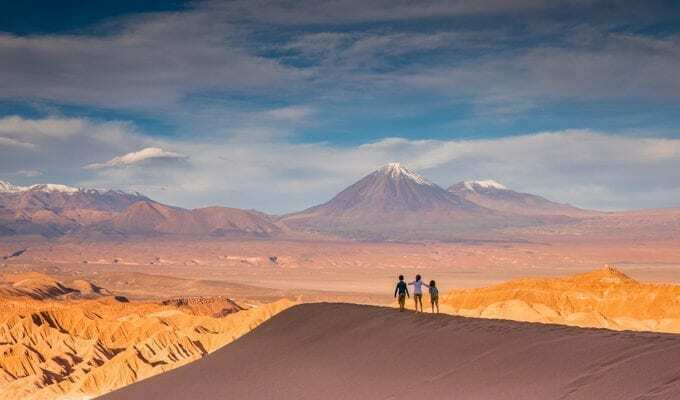 We flew from Patagonia to Santiago for a couple nights and then on to the Atacama Desert up north. My post on that portion of the trip is HERE. We used 550,000 frequent flier miles for five free LA-Santiago business class tickets on United. We then purchased round-trip flights between Santiago and Punta Arenas on LATAM for $1,383. We received a media rate at the hotel, but otherwise would have paid $5,090 for our three nights or $1,697 per night. 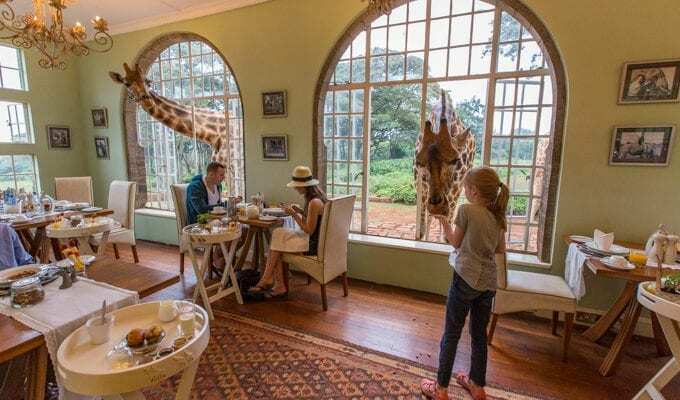 That technically makes it one of the most expensive places we’ve stayed, but that included meals, wine, excursions, park entry and airport transfers. If I add up previous spring break trips to Hawaii or Mexico with two hotel rooms, meals, a rental car or transportation and tours/guides, the figures aren’t all that different. Calculating the best time to go, value-wise is easy. The hotel is open eight months a year. 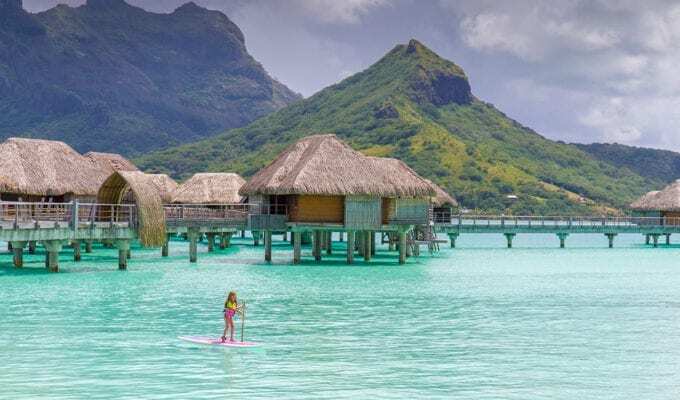 High-season is five months of that (generally November through March) and mid-season the other three (October and April/May), when it’s less-expensive for adults and kids stay free. If you book seven or more nights (you can combine it with Tierra’s other two properties) you save 20%. So go on a trip to Patagonia mid-season, take the kids and add on a stay at Tierra Atacama or Tierra Chiloe. That’s what we did, heading from Tierra Patagonia to Tierra Atacama for four nights. Just don’t try to get from Patagonia to Atacama in one day – that would be a long travel day for kids. We broke it up with two nights in Santiago. Bring layers on a trip to Patagonia! We typically wore t-shirts, sweatshirts/fleeces and warm jackets starting out on hikes and then shed layers as we went. For pants, jeans and hiking pants both worked well. And don’t forget waterproof jackets and pants – and actually bring them with you on each excursion! This looks incredible. 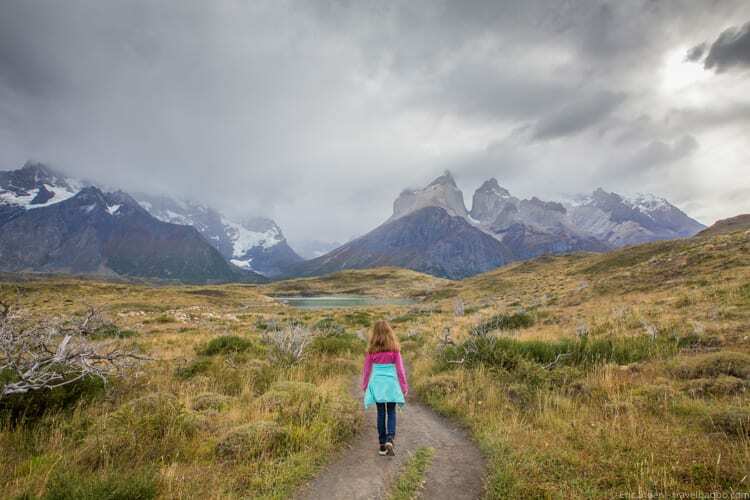 It’s definitely a place that we will look into when we bring our kids to Chile, and a much different experience for our visit to Patagonian Argentina. The trip looks incredible and the hotel looks amazing, will be looking into Chile for a Spring break or Thanksgiving trip! Thanks for the inspiration! Looks like such an amazing trip but sorry you got wet, tired and forgot your rain pants! Wow, it must be great to be able to do this as a spring break.. unfortunately it’s a loooong way for us. But such a beautiful place, wow! 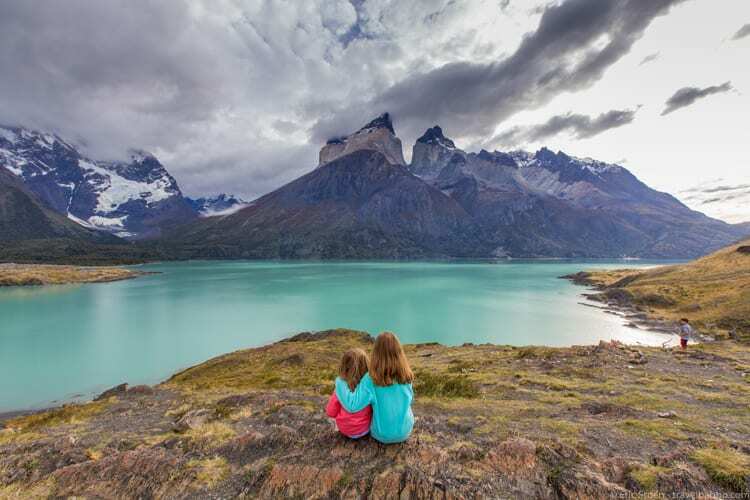 That flight over Torres del Paine alone… our daughters would love the horse riding too. 🙂 Perhaps when we’re able to travel for a longer time… this will be on our list for sure! We are going in April with a 23 months old. Would you recommend bringing the BOB stroller with us for short hikes? We’re not a family to travel with strollers, especially a larger stroller like a BOB, so I would say no. I think a backpack would work a lot better? I didn’t see anyone with strollers on any of our hikes. Eric, this sounds like a great family adventure. I’m a little late getting started on travel planning but, am going to be in Patagonia with our kids (8 and 10) over the December/January period. Unfortunately Tierra Patagonia is all booked up. Would you have any other recommendations for places to stay down there? Also, did you look at/consider doing one of the multi-day hikes in Torres del Paine, such as the W, when you were there? From what I’ve read, it seems like this may be better for older kids (12 and up) but I’m wondering, based on what you saw/heard, if you have any thoughts on if this would be doable with younger (but active:) kids. Sorry for the delay! I was unplugged in Greenland. Hotel Las Torres (https://www.lastorres.com/en/) is the other hotel I’ve looked at nearby, but I’ve never stayed there. I’ve never thought about long hikes with my kids. They don’t love camping, and up until 10 or so they’ve tended not to want to do hikes of more than 5 or 6 miles – or they’ve complained a lot, which isn’t fun for me. I would say you definitely want older kids for hikes like that – 12 could be good, depending on the kid and, like you say, how active they are. We didn’t see a lot of kids while we were at Tierra Patagonia, so I didn’t get feedback from other parents. Ask the lodge that you book. They’ve undoubtedly had a lot of experience with their kid guests. Thank you for the tips! Good idea to check with the hotel about the hikes. I tend to agree that day hikes may be a better choice for us until they’re older. We also didn’t see a lot of younger kids when we went to Machu Picchu (for the day), so this may be a similar situation.